I don’t know whether it’s the promise of Spring, but I have been back on the interiors bandwagon the last couple of weeks, much to Mr E’s amusement/fear. I absolutely love decorating or styling our little home and I am always on the lookout for the next project I can be doing. 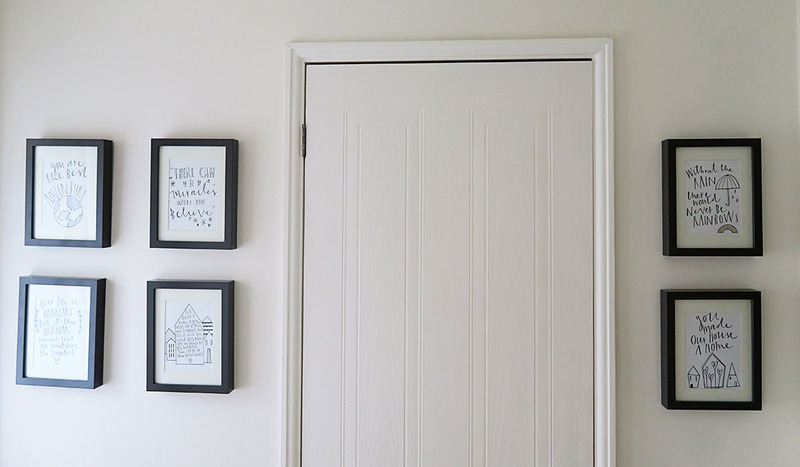 Last year was a big one for us in terms of projects- we completely gutted and changed our bathroom, replastered and decorated our living room and also gave our bedroom a little spruce over. There are exciting projects imminent for us- we are just waiting on a couple more bits and pieces and then we are going to be putting Mads and LL into a joint bedroom, with Mads current room becoming our new study. As I work from home and have been for a year now, I just feel I need an extra space to escape to if I need to get on with work- Mr E often lets me do work on a Saturday afternoon if we aren’t already busy, but at the moment I have to either sit on our bed (not good for my back!) or go to a local hotel- neither are ideal, and so I am excited to have a little work space for us both. But in the meantime I decided to give our downstairs hallway a little bit of a makeover. It’s a very small, non descript, pretty bland area and as such I have never really bothered with it before now. But as it is the first place people walk into as they come into our home, I was racking my brains to find ways to make it look a bit more welcoming. Because the hallway is so small we decided to fill up the whole of one wall with pictures. Our frames are the trusty Ribba ones from Ikea– we now have four photo walls in our house and every frame is a Ribba one but in different colours- I just really like the style. It’s hard to pick up on camera but these are a grey colour which I really like as I thought black might have been a bit harsh. The first quote I decided on was actually one I made up myself! 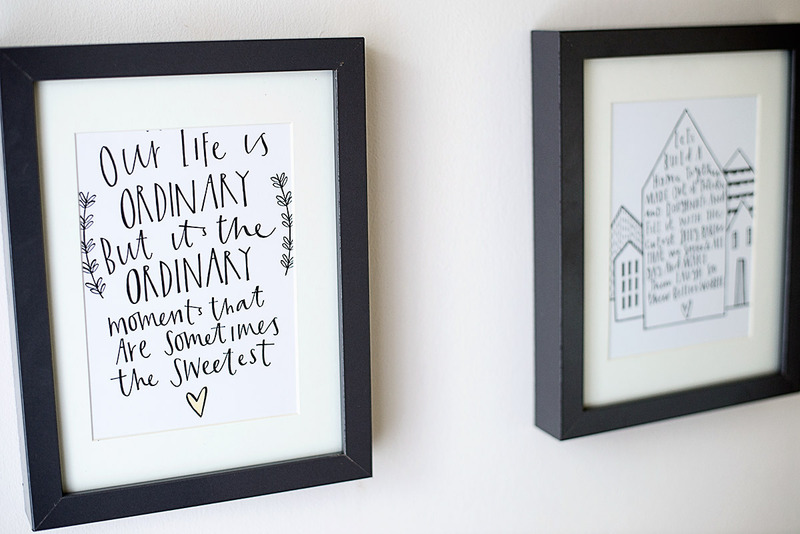 I love my instagram, blog, facebook and pinterest profile- it quite simply is ‘Our life is ordinary, but it’s the ordinary moments that are sometimes the sweetest.’ Obviously this is something I am quite passionate about (hence my Ordinary Moments project) so I like that I have my own quote on the wall. 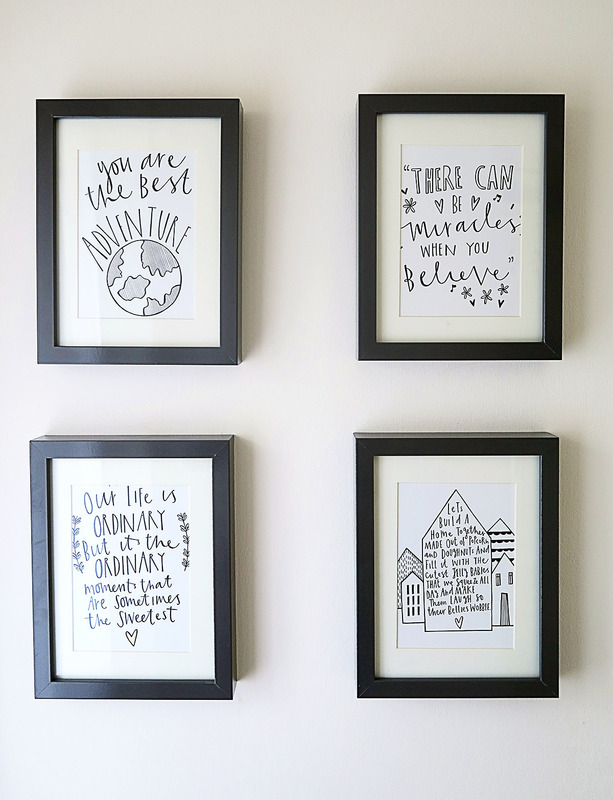 The ‘You are the Best Adventure’ quote is one that I really love- we are a family who love to travel so I asked for Cheryl to draw a globe- plus my girls really are by far the biggest and most exciting adventure we have ever had. The bottom quote is the only one we had that wasn’t something custom made- I had seen this one and just liked it and thought it was cute as strangely Jelly Babies are quite a big part of our family- every time we go on a long journey our tradition is to have a pack of jelly babies to share! This quote is actually a song lyric so I asked for little musical notes on it- it’s a song that means a lot to me because there’s quite a surreal story behind it- it was the song that was playing when Mads was born. The final two prints are on the other side of the door. 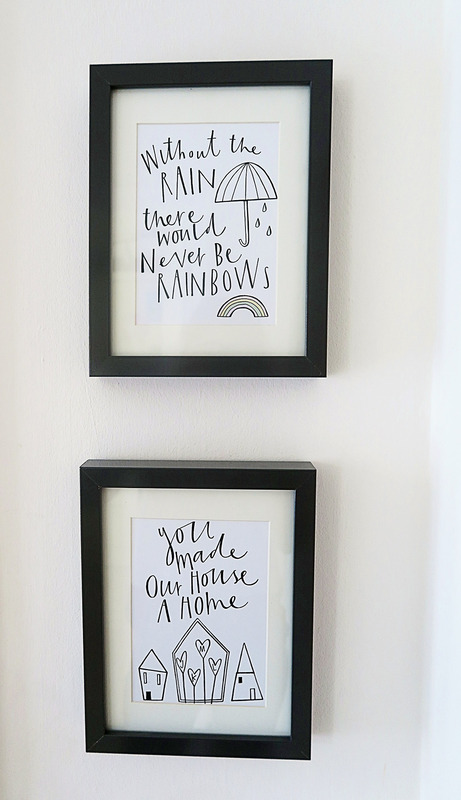 I have always loved the rainbow quote and I also love the quote ‘You made our House a Home.’ I also asked for our initials to be put in hearts in the little house. 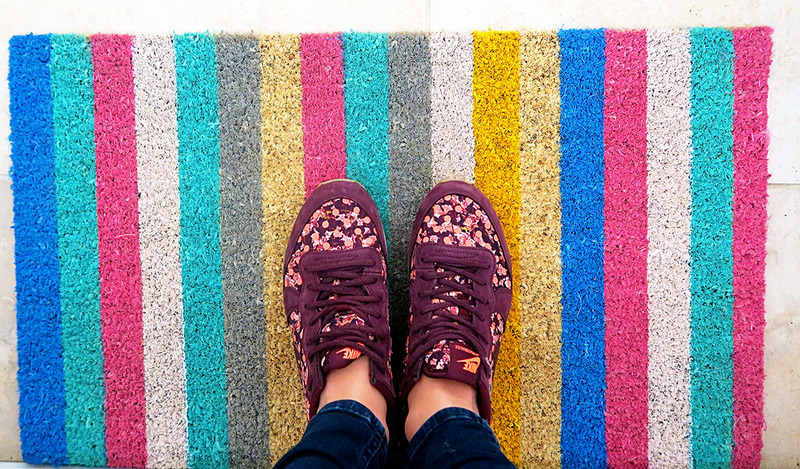 I found this multi coloured stripy doormat in Oliver Bonas and I just had to get it. Overall I am really pleased with our mini makeover- it’s not the most exciting of spaces which is why I haven’t really done anything with it until now, but now at least it has a bit more going on than it did before. Plus it has satisfied my interior urge until we do our girls bedroom and study in a couple of months time! Oh I think it looks great, and it’s so lovely to have your ordinary moments quote there too. It must be the hint of Spring in the air; we’ve started a little kitchen makeover and I’ve spent this weekend perking up the bathroom grouting! It looks beautiful, hallways sometimes get forgotten as they are not a space we spend a lot of time in but are the first place our visitors see. Those prints are lovely and that mat’s gorgeous, too. I need to give our hallway a makeover, too, and now I’m itching, too! Absolutely love this hun, it looks great! 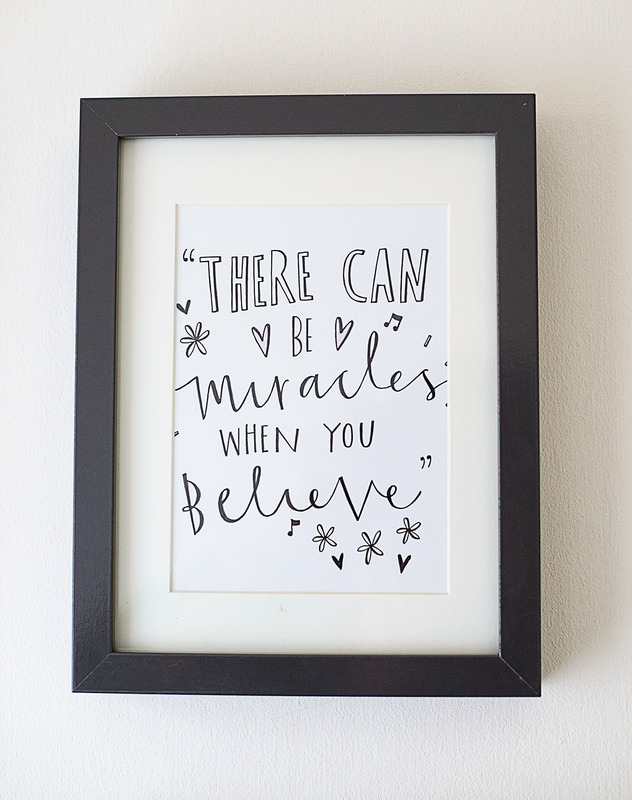 I love retro type prints and like you I’ve never really bothered with my hallway but its next on my list to decorate, along with the landing! A lovely update for your hall, I think Spring makes you want to change things up a little bit, fresh start and all that! The prints are gorgeous. Ahh Katie these are absolutely beautiful. 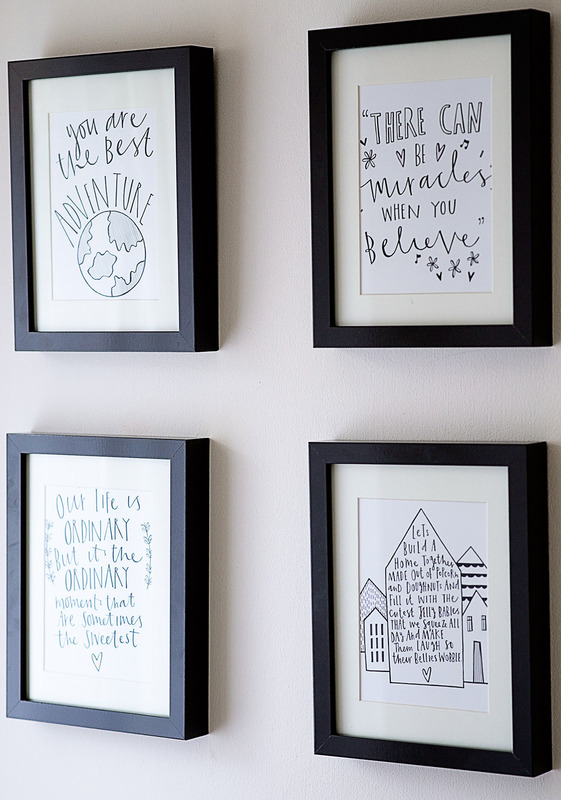 I love them and having meaningful amazing quotes on the wall specially designed for you is just awesome! I love all these and the creativity behind them. They are amazing. Thanks for hosting darling. Thanks I am so pleased with them! Fab prints. And especially nice that you were able to make them personal to your family. I adore your doormat. We have a colourful spotty one but it is looking faded now. Thanks lovely I am really pleased with it. I think I need to take a look at Ikea for those grey frames – I have the black ones & white ones but love the idea of grey ones! The prints look great! Adorable & very welcoming. Makes me want to snuggle in & hang out. It looks lovely, I love the black and white theme with a splash of colour! I adore your prints, Katie. They sum you and your family up perfectly. No wonder you’re so happy with them. Ooo, and …. we’re going to be doing the same with our boys later this year too. They’ve asked to share a bedroom. We’re probably going to put it off until the end of the year though as the littlest loves his cot and we want to wait until he’s in a toddler bed. They’re actually moving in to the room that we currently use as the office so the office will be moving in to another room. All systems go!! I love that you have made the most of this little space where usually it would go unloved. The quotes are so sweet and how lovely that they are personal and unique to you. Those prints are wonderful Katie , everything looks absolutly perfect. Thanks Joanna- I am really pleased with them. Those prints are absolutely beautiful! Just such a special idea. The personalise quotes are very unique and very classic. Lovely blog and you have darling daughters. Thank you for being you.